In her first solo international trip as first lady, Michelle Obama made a surprise visit to Haiti Tuesday to witness the aftermath of the catastrophic Jan. 12 earthquake that devastated the impoverished Caribbean island, claiming over 225,000 lives. Jill Biden, wife of Vice President Joe Biden, joined Michelle Obama. Both women toured the ruins of Port-au-Prince by helicopter. 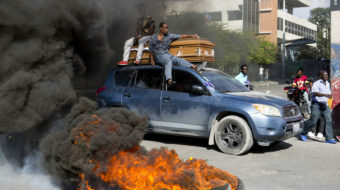 Sources say they wanted to visit Haiti for some time but did not want to interfere with ongoing humanitarian efforts. Experts describe the Haitian earthquake as the deadliest natural disaster in modern history. Despite a massive aid effort, more than a million survivors are homeless and many live in miserable conditions under tarps and homemade tents in makeshift camps around the capital. 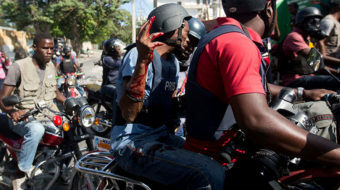 Haiti’s government says the final death toll could number more than 300,000. 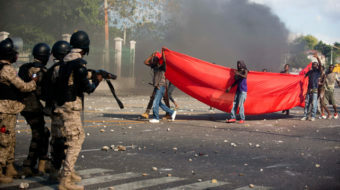 Prior to the quake, Haiti, known as the world’s first independent black republic, was believed to be the poorest country in the Western Hemisphere. It was already struggling with an 80 percent poverty rate. Mrs. Obama told Haitian leaders and the people she visited that the U.S. and the world would help them rebuild. She is also urging the international community not to let up on its support. “It’s going to take all of us. In order for Haiti to get back to where it needs to be, it’s going to take the world continuing to invest, to partner, to show that sense of compassion,” she said. 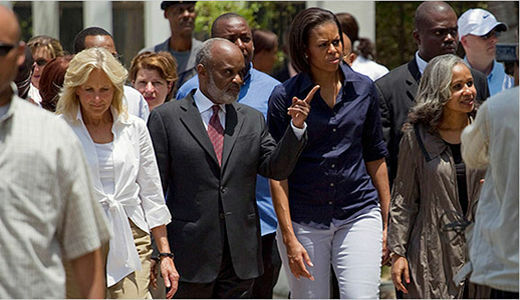 Mrs. Obama and Mrs. Biden met with Haitian President René Préval and his wife Elisabeth. They also visited a school and met with students. Earlier they met U.S. and international relief workers at a United Nations base and addressed Haitian civil society groups. 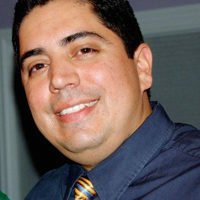 The U.S. deployed about 20,000 troops in the days following the quake and Washington has sent in dozens of staff with the U.S. Agency for International Development (USAID). The Obama administration has already provided $1 billion in humanitarian aid to Haiti and pledged an additional $1.15 billion to boost the rebuilding efforts. According to USAID almost 1,000 aid groups are on the ground in Haiti. Meanwhile Congress is calling for the U.S. to take the lead in relieving Haiti of its estimated $828 million debt to international institutions. The House approved by voice vote Wednesday and sent to the president legislation that instructs U.S. directors at the International Monetary Fund and other global development institutions to use their votes to cancel Haiti’s debt. The debt relief bill, passed earlier by the Senate, would urge the immediate and complete cancellation of all debt owed by Haiti to multinational institutions. On Tuesday night after her trip to Haiti, Michelle Obama arrived in Mexico City for a two-day visit where she is expected to talk with Mexican leaders about improving education for the poor.